Locality: Henderson No. 2 mine, Chibougamau, Nord-du-Québec, Québec, Canada Copyright © John A. Jaszczak. Cubanite is a yellow mineral of copper, iron, and sulfur, CuFe2S3.Cubanite was first described in 1843 for an occurrence in the Mayarí-Baracoa Belt, Oriente Province, Cuba.Cubanite occurs in high temperature hydrothermal deposits with pyrrhotite and pentlandite as intergrowths with chalcopyrite. It results from exsolution from chalcopyrite at temperatures below 200 to 210 °C. It has also been reported from carbonaceous chondrite meteorites. Color: Brass yellow, Bronze yellow. 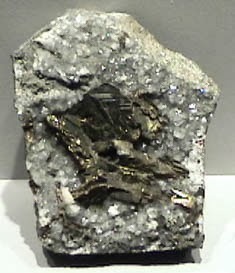 This sample of cubanite is displayed in the Smithsonian Museum of Natural History. The sample is about 6×10 cm and is from Henderson mine #2, Chibougamah, Quebec, Canada. Are ants the answer to carbon dioxide sequestration?